The Dry Arch Children's Centre has training and meeting rooms at our main Centre in Glenshane Business Park Dungiven. This space can be hired by organisations or individuals (subject to availability). Competitively priced with outstanding service and facilities. Prime location - located close to the main Belfast to Derry/Londonderry Road. Conducive environment with necessary equipment for presentation, meetings or group programmes. Professional and supportive team with onsite technical support. Catering can be provided on site. 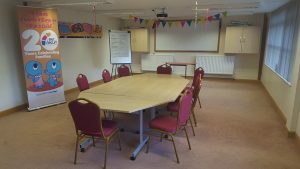 Our training room is suitable for groups up to 25 people and can be arranged in a variety of styles such as boardroom, horse-shoe or theatre. We can provide you with any necessary equipment including data projector and laptop, overhead Projector, TV/Video or Flip chart. We have a small kitchen with tea/coffee making facilities next to the training room. The training room can be set up in boardroom, Classroom, Theatre, U-Shaped or other styles. Buffet Lunch and other requests available. If you are a regional or national organisation with no local meeting space why not consider using our venue. We have additional meeting rooms which can facilitate meetings for up to four people. Rooms can be hired for a very reasonable hourly rate. Enquiry for booking please contact our Dungiven Centre on 028777 42904 or email joanne.mccloskey@dryarchcentre.co.uk.